Correction July 1, 2014: In the original version of this article, I attributed a comment to Metrolinx Chair Rob Prichard regarding the sharing of information between bidders on rapid transit projects, and expresssed my surprise that this did not match the process I was familiar with from my own public sector experience. In fact, the remark was with regard to sharing information about questions to Metrolinx from candidates in the municipal election. The procurement process does include sharing of information via addenda to Requests for Information issued to all bidders as mentioned in the Rapid Transit Quarterly Report. I regret this error and frankly cannot understand how I scrambled two very different topics together. However, the process for dealing with candidate questions at Metrolinx is completely different from that followed by the City of Toronto. Where Metrolinx preserves confidentiality about questions a campaign might ask, the City posts responses to any query online so that no candidate has the advantage of professional advice not available to others. The basic premise is that the staff works for Council, not for an individual member or candidate. As a public agency, Metrolinx should be providing information to everyone. The discussion (which starts at about 21:10 of the meeting video) emphasizes that Metrolinx has no part in the election, and yet the confidentiality of information exchanges could offer an advantage to a campaign that is unknown to other candidates. The Metrolinx Board met on Thursday, June 26 in a quite celebratory air. With the provincial election out of the way and the return of a pro-transit Liberal majority to Queen’s Park, Metrolinx sees a rosy future for transit expansion. They wasted no time telling anyone who would listen about the great work now at hand. Another burning question about the recently announced funding is just how much money is on the table, especially how much is new money as opposed to funds earmarked for specific projects like RER or previously announced/expected for projects in the “Next Wave” of Metrolinx undertakings. It didn’t take the assembled media long to notice that the GO RER scheme would gobble up much of the $15b earmarked for transit in the GTHA. I will return to this in a separate article. A heavy rainfall over the central part of Toronto on June 25 caused extensive flooding in the Don River that closed the Don Valley Parkway, the Bayview Extension and the GO Richmond Hill trackage. “What is GO doing about this” was a hot topic even before the meeting was underway. GO President Greg Percy talked about short term and long term fixes needed to make the line immune to floods. In the long term, the “big fix” will require that the line be regraded so that the track is higher than expected floodwater levels, and that the foundation is impervious to washouts. Such a project would not be cheap, and would likely be bundled with any upgrades required for the proposed Regional Express Rail service on this route. Embankment stabilization project at mile 3.2 on the Bala Sub. Embankment failure monitoring as a pilot project at mile 10 on the Oakville and Bala subdivisions. Installation and re-sizing of various culverts near mile 10 on the Bala. For those who don’t know the railway nomenclature, the Bala Sub is the Richmond Hill line, and the Oakville sub is the Lake Shore West line. Mileages are measured from near Union Station where these branch off from the Union Station Rail Corridor. 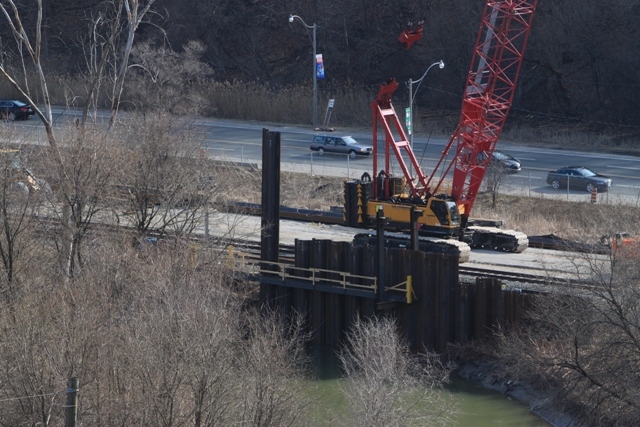 Here are photos of the embankment work on the Bala Sub just south of Bloor Street (mile 3.2) in its early states on April 17. The work is now nearly complete, and a substantial rock wall has been built behind the piles here. Also visible is the degree of erosion from river flow. The location where a GO train was stranded on flooded tracks in July 2013 is not far north of this point. The GO Transit Quarterly Report talks of both the difficult winter operations for 2013-14 and also of the move to half-hourly service on the Lake Shore corridor, but gives no information about ridership effects of either of these events. Anyone who participated in the Electrification Study workshops will know that GO and Metrolinx were certainly not leaping at the opportunity to transform their services. Although frequent, all-day GO service was an essential part of The Big Move, the work needed to implement it was not proceeding quickly beyond the Lake Shore and Georgetown (now KW) corridors where shorter-term goals drove the need for improvements. The original study reported in 2010 on the options and economics of electrification, and concluded that the best candidates were the those two corridors based on the service levels likely to operate in them. The lines with less planned service would, of course, have fewer trains and trips that would benefit from a change in technology, and the implementation cost would not be recovered in savings and operational benefits as quickly if at all. In 2010, the cost of full network electrification was estimated at $4b in then-current dollars. The implementation plan for a full network conversion stretched over nearly 30 years for various reasons including the rate of capital spending, the staging plan for migration to a new GO fleet, and the desire to concentrate on the primary corridors. Even then, a project just to convert Lake Shore and Georgetown would stretch over two decades, and work on the Barrie, Stouffville and Richmond Hill corridors would not even begin until years 22, 29 and 32 respectively. This schedule was met with wild laughter when it was published, but it has until quite recently remained the only official pronouncement on timing for a full electrification. Now, Metrolinx claims it can complete the network in ten years. They admit it will be a challenge, but say it can be done. What we now require is a detailed plan that is driven by a desire to achieve change on the GO network rather than delaying it for so long as to be meaningless. An important change in the outlook for RER is the recognition that electric and diesel operations can co-exist with diesels handling the outlying parts of the network with infrequent service. Metrolinx also acknowledges that a mix of equipment is needed to serve different types of demand and service. The presentation speaks of “RER” as a successful mode and shows examples from Paris and Stockholm which are only two of the many cities with this type of network. I cannot help thinking that Metrolinx has “discovered” regional electric rail service in much the same way that LRT was “discovered” after a long period when provincial policy refused to acknowledge its existence. The two modes are not that far apart technically, although obviously LRT is aimed more to local, in-town services right down to near streetcar implementations. In both cases, there are alternatives to “the way we always do things”. As usual, Metrolinx will filter their plans through a Business Case analysis. This could prove illuminating depending on the mechanics of such an analysis (see the report on Economic Analysis later in this article). One fundamental question with transit expansion is not just “how much will it cost”, but “what are the implications if we don’t build it”. Another is to examine how groups of projects can be more than the sum of the parts, but also that building every line on the map could waste scarce funding on pieces that contribute little to the overall plan. Fares are mentioned here only in the context that increased ridership will bring more revenue, but this will not necessarily offset additional costs of the GO operations, not to mention local transit services to feed GO routes. This topic does come up, however, in the Yonge Relief Network Study. Any business case analysis must look not only at fares as they now exist, but at how they will change in a truly integrated regional operation where attracting riders may take precedence over maximizing fare revenue. The total cost is a matter of some debate. In the staff presentation, GO President Greg Percy quoted $15b, but CEO Bruce McCuaig said that it could be in the $11-12b range. Chair Rob Prichard, during the post-meeting media scrum, thought it could be whittled down even further, maybe to $9b. The idea of local municipal contributions also floated by but without specifics. Considering the paltry amount Queen’s Park gives to local transit today and the extra costs providing service to an expanded GO will entail, expecting the municipal sector to pay toward that expansion is remarkably arrogant. One important issue related to cost will be the degree to which GO operations must meet current US Federal Railroad Administration (FRA) standards. According to Greg Percy, GO is talking to Ottawa about relaxation of these standards for commuter operations, but this is entangled with the debate over dangerous goods movement. The scope of work is daunting and more extensive than the Electrification Study complicated because the new infrastructure must not only deal with co-existence of electric infrastructure with railway operations (including freight on lines GO does not own) but also with substantially higher service levels (frequent, all day). It is one thing to make room for a one-way peak period service every half hour, and quite another to accommodate 15 minute headways both ways seven days a week. Among the necessary “success factors” is a commitment by Queen’s Park to ongoing funding. This is not a project that can be turned on and off to suit the whims of a Premier more interested in this week’s polls than in long-term network building. Corridors that remain under ownership by the freight railways, CN and CP, will have to meet their requirements, and past discussions have not been particularly welcoming according to GO officials. The list also includes Union Station for “capacity, clearance and grounding, and heritage approvals”. This is troubling because the work now underway at Union was supposed to have taken the requirements for electrification into account. This is a huge collapse of what was shown as a three decades plus implementation only a few years ago. To put this in context, we will see a complete transformation of GO Transit at or before the timing of proposed subway lines in Toronto (Scarborough 2023, Richmond Hill sometime in the 2020s at best, DRL further off again). It is amazing what can be achieved, at least on paper, when a government is committed to a project. Needless to say, the RER scheme was discussed in the context of proposals floating through the Toronto mayoral campaign, notably John Tory’s “Smart Track”. With great tact, both CEO Bruce McCuaig and Chair Rob Prichard emphasized that Metrolinx is looking at all proposals, but that it would be inappropriate to comment on them. Staff will report back to the Metrolinx Board in September 2014 with more details. Will Ontario see this through, or will RER, like Transit City, be stillborn thanks to changes in policy, fear of the total cost, and impatience for results that support election campaigns? Metrolinx together with the City of Toronto, the TTC and York Region, are reviewing a wide range of options for “relief” of the demand crunch on the Yonge Subway and Bloor-Yonge Station. This report is an update on the study’s current status. Everyone has an idea of how “relief” should be provided, indeed of what the word even means. The situation is hardly new. Back in the late 1980s, the subway was bursting with riders long before growth in the 905 started to funnel them by the thousands into subway terminals. Two things happened: building downtown rapid transit proved unpopular both for downtown and suburban politicians, and the recession of the early 90s lopped 20% off of the TTC’s annual ridership. The problem solved itself, at least for a time, although the nature of the demand is more complex today than it was 25 years ago. Relief isn’t just about the central subway system, but of the regional road network that cannot handle all of the trips it should be serving. When we talk about “relief”, competing interests want to ensure that they get a slice of the spending pie, and the one-project-to-solve-all-problems approach simply cannot succeed. Since late 2013, the study has conducted various public sessions to explain its work and to collect a long list of suggestions. This list contains just about every scheme that anyone has ever floated and we have now reached the point where it must be trimmed. Everyone’s pet project cannot survive into the final evaluation. Through the summer, the study team will winnow down the list into “scenarios”, groups of complementary proposals, for detailed review and public feedback. What was originally planned to be a multi stage process boiling down the long list of ideas, through a medium list and then a short list and finally bundles of short list ideas will be compressed. Now, the culling of higher performing ideas will happen quickly, and these will be bundled into the “scenarios”. Of course, the original plan was structured both to defer significant decisions beyond the elections and to avoid annoying people by dropping too many pet projects from the list too early. Now, the provincial mandate is to get things moving, and languid, inoffensive consultation just doesn’t fit the mood of the day. The idea fits into a possible relief scenario. The idea is worth doing in its own right and should be done no matter what scenario is chosen. The idea is good but does not address the relief problem; it would go into the hopper for other studies including the Big Move update. Examples include the Transit City LRT lines that are not yet part of the first or next wave of Metrolinx projects. The idea is not feasible for construction or operation. At this point, this category includes all of the schemes for building new capacity parallel to or along the Yonge corridor including a Bay Street subway or additional tracks/tunnels for the Yonge line. The study has been generous in the options left on the table including schemes to use the “Leaside Spur” which is now a bike path, not a rail corridor. The complete list of “higher performers” is on pages 22-24 of the presentation. Several of these will fall off the table once someone actually considers the implications of their implementation. An important part of the study is that the schemes will be evaluated for alternate future land use scenarios as well as various transit network implementations. Unlike The Big Move, we will see the behaviour of different subsets of ideas to gauge how well these perform relative to each other. Other areas to be considered include fare policy, travel demand management, active transportation and transit oriented development. It will be interesting to see whether these are presented with a clear-eyed view of the possibilities for each option and the recognition that each of these behaves differently for different parts of the travel market. Public participation will initially be online starting, according to the report, in “late June” although I suspect they have missed that date already. More detailed work, short listing and final consultation will come in the fall. The first question in debate on the report came from Chair Rob Prichard who asked whether a relief subway line will be needed in addition to the RER network. When will Metrolinx have a position on the need for a DRL? Leslie Woo, Metrolinx VP of Planning and Innovation, replied that the RER concept was always in The Big Move, but the big change this time around is the commitment to deliver it quickly. This affects evaluation of a relief subway line, although the change may only be a question of when it is required, not if. How much effect will the RER have in 10 years on demand pressures that drive the need for a DRL. There are lots of myths about what the DRL or other lines will achieve, and this is the first consolidated review of all options. The study will complete in early spring 2015. Prichard noted that the TTC’s Andy Byford says that a DRL is his top priority. Woo replied that in the absence of anything else, something must be done soon to address capacity problems. Both medium and long term fixes are needed. Newly minted board member Anne Golden (formerly head of the Transit Revenue Panel struck by Premier Wynne in 2013) said that she is told “by people who know about transit” that the DRL is not needed. There are times my respect for board members falls through the floor when they prejudge the outcome of studies and, in the process, hint at what those studies should conclude. Any need, or not, for the DRL is context specific and depends on what else might or might not be done. It is impossible to know today whether “the fix is in” for one outcome over another, but definitely the RER scheme changes the landscape in which all rapid transit proposals would be evaluated including various subway extensions near and dear to various political hearts. As both the Metrolinx and City studies progress, we will see whether the assumptions and tradeoffs represent well-considered planning, or the machinations of politicians with too many crayons in their desk drawers. The Metrolinx Act requires that the regional plan, aka The Big Move, be reviewed every ten years counting from 2006. Work has begun on a new iteration of that plan with 2016 as the goal for completion. The starting point will be an existing plan plus works already in progress or completed, not a grab bag of wish lists from every municipality in the GTHA. Improved accountability and transparency (hardly a Metrolinx watchword) will, it is claimed, flow from Queen’s Park’s “Open Government Initiative”. Financing cannot be ignored, and the viability of a plan must include a clear statement of how it will be paid for both in capital and operating budgets. The role of municipal transit in provision of feeder/distributor services to the network must be an integral part of the plan. Service and fare integration are essential to getting the best benefit from the entire network. Continued pride in a high farebox recovery rate may come at the expense of a network attractive enough to make a real difference in transportation behaviour. The limitations of transit to relieve congestion must be clearly acknowledged. The vast majority of transit proposals (measured by potential ridership) deal with commuter trips to Toronto’s core, and this does little for people whose journeys are not served by that network. A few buses an hour on a reserved busway do not make much of a dent in auto traffic. The plan cannot be presented as an all-or-nothing proposal with no sense of which components contribute the most, the soonest to a better network. The almost total absence of freight traffic from Metrolinx discussions must be addressed including questions about just how much highway capacity is actually available for a variety of road users. This is analogous to discussions now underway about the appropriate allocation of road space within the City of Toronto. The concept of “mobility hubs” must shift from a scattershot review of every transit intersection with a Metrolinx logo on it. The focus should be on integration with land use plans so that growth at the most important hubs is nurtured. Equally, there must be a recognition that just because two routes intersect, the location is not necessarily appropriate for development as a hub. Pearson airport must be more than a destination for a premium fare service from downtown. The polite fiction is that the UPX is a worthwhile investment, a position disputed even by the Provincial Auditor. In fact, UPX is a legacy of a long-gone Ottawa scheme inherited by a former Premier who didn’t have the sense to kill or restructure it when he had a chance. If Metrolinx is serious about changing modal splits in the region, then they must treat Pearson as a major transit node not just for businessmen but for everyday riders including the huge workday population in the airport’s vicinity. To Metrolinx’ credit, some of these issues already appear in their report, albeit with less aggressive wording than I use here. The promise of Metrolinx and The Big Move has been throttled by timidity, by an unwillingness to commit to large-scale spending or to the revenue tools needed to make this possible. Public input to the process begins in fall 2014 and runs into 2015 with “Draft vision, goals and objectives” followed by a “Strategic framework”. Somehow, Metrolinx must avoid this following the path of so many EAs in which those who wish to contribute to the process are bored to tears defining process, but never getting a chance to talk about content. Whether the many “stakeholders”, interested parties of all stripes, will be content to wait until mid 2015 to sink their teeth into substantive policy and draft networks remains to be seen. The worst possible situation, one all too common with “public participation” would be for the push for study completion to overtake the opportunity for meaningful input. From sessions I have attended and from feedback I have heard from others, the last thing people want to do is to waste their time commenting on a plan whose content was decided long before they were asked. Indeed, if the Wynne government expects to have any credibility for its transportation platform in the 2018 election, then real progress and real attention to the needs of the GTHA are required. What is unclear is how much of this process would not exist in a conventional procurement, and what extra costs the project will bear to support the rhetoric that PPPs are good for us. What we do know from previous descriptions of the process is that it adds about one year’s work to an already immense project. When I spoke with former Transportation & Infrastructure Minister Glen Murray [our paths crossed at a social occasion] before the new Cabinet had been announced, he assured me that the LRT lines were still alive. It is intriguing to note that two Metrolinx web pages contain reference to them as current projects, and one even mentions the SRT to LRT conversion. The Eglinton Crosstown LRT will add 19 kilometres of new transit from Mount Dennis (Weston Road) to Kennedy Station. The Sheppard East LRT will add 13 kilometres of new transit along Sheppard Avenue from Don Mills subway station to east of Morningside Avenue. The Finch West LRT will add 11 kilometres of new transit along Finch Avenue from the planned Finch West subway station at Keele Street to Humber College. A $1.48 billion investment to replace the current Scarborough RT. Recent statements by Premier Wynne have been taken in some quarters as emphasizing that plans as they now stand should not be messed with by local Councils, but others sense that her government would be open to rethinking the Scarborough situation. One obvious conflict (which has been mentioned already elsewhere on this site) is that the proposed frequent service on the Stouffville corridor would directly compete for passengers with the Scarborough subway and render the business case for that subway untenable. The wild card throughout any such discussion is the Scarborough Liberal Caucus which notably includes the new Minister of Infrastructure, Brad Duguid. Will a surface network including major GO improvements plus LRT sway Scarborough’s support away from a subway extension to a more varied and extensive set of both local and regional projects? The Annual Report for the year ended March 31, 2014 includes an Account Receiveable for the work done to date on the Scarborough LRT project in the amount of $78,963,000. Metrolinx is quite proud of its planning process including the use of benefits/business cases analyses and “evidence based” planning. These are fine words, but when one looks under the covers, actual practice has left much to be desired. Although I did not agree with everything in the critique of Metrolinx from the Neptis Foundation, we agreed on two points. The first was that the promise of The Big Move for what we now call “RER” was left unfulfilled right up to 2013 and has only now become a major plank in Metrolinx and government policy. The second was that the analyses purporting to establish the case for various projects were inconsistent in their assumptions, scope and methodology. A near-fatal flaw in the implementation of The Big Move and analysis of its components is that project-specific reviews look at schemes in isolation. Whether the required investment (not to mention the bite taken out of overall available funding) is the best of competing schemes for the network is ignored. This is not just a question of which route or technology option might be chosen in one corridor, but of the relative benefit of spending on one project versus other parts of the network. What Metrolinx hopes to build is a unified method for its analyses taking into account many components and doing so on a consistent basis. Two additional components are worth mention. Regular readers here will know that I consider the imputed value of future tax revenue thanks to transit investment to be just short of dishonest. Whatever one might call it (TIF or Tax Increment Financing is a common term), the premise that transit investment will create value that can be “captured” (for which read “taxed”) to recoup part of the investment is often founded on dubious premises. Worst of these are the assumptions about the speed and scale of any new development that is truly transit-related, and the degree to which the market will absorb a tithe intended to recoup transit costs. This is a particular challenge if the land in question is not already on a prime site where location trumps price. Another problem is that the benefit of a new line may touch a much wider region and set of properties than simply those where new development eventually occurs. How much more could or would existing landowners pay in taxes for the imputed increase in their land or buildings? Which types of land use would be subject to the tax, and would it apply only to future value when and if the current use and ownership end? What other capital or operating budgets equally have a claim to the value of new development such as utility construction or schools? Too often, LVC/TIF for transit is discussed as if nobody else is at the table. One of the more outrageous examples of this type of calculation was included in Markham Councillor Jim Jones’ plan for an Urban Rail line in the Stouffville to Union corridor. He presumed that a swath a few kilometres wide along the entire corridor (including much of the Toronto Port Lands) would contribute new tax revenue to pay for his scheme as if it were the only one that might benefit affected properties, or was even physically close enough to them to have an effect on their value. Mayoral candidate John Tory hopes to raise $2.6b for a municipal contribution to his “Smart Track” scheme (an even longer version of Jones’ plan) through TIF revenues in the core area along the route. This is the same area where developers take every opportunity to reduce their tax exposure, not contribute to the imputed value of a new transit route on their properties. In both cases, a pet project scoops the presumed uplift in value as if each project were the only one needing and deserving of funding from that source. If nothing else, the Metrolinx study should establish a base line for estimating just how much this revenue stream is worth and what assumptions must be validated for it to be applicable to any new project. The second group of values that should be codified are the alleged benefits of an investment. Soft dollars such as imputed time savings and the value of road space released by trips diverted to transit should be counted on a consistent basis and reported separately in any analysis. Far too often these are used to produce a positive benefit:cost ratio when much of the “benefit” either cannot be captured through a tax or fee, or represents a transfer of investment to riders through subsidization of lower-cost travel. Getting people out of their cars has clear benefits as a planning strategy not to mention environmental benefits and the city’s ability to support higher-density development, but it is important that these benefits do not flow back directly, if at all, to the agency that funds the investment. The values assigned to these soft benefits can skew an analysis by selective use of different values from one study to another. Codification of this process will ensure that at least the same scheme is used to compare all proposals rather than ad hoc methodologies for each project. There may still be disputes about the overall methodology, but at least we will be addressing the same issues in each study. Work to standardize benefits analysis is underway jointly with the Montreal and Vancouver regional authorities. Although working versions have been discussed at industry meetings, it is unclear when or if the methodology will be made public. Its first application will be the analysis of the RER proposal, although given that the government has decreed that this will be built, the exact role of the analysis remains to be seen. Perish the thought that the centrepiece of an election campaign might be found wanting, and yet it will be essential to show the analysis, warts and all, to establish credibility. Finally, I must say a word about “evidence based” analysis, a phrase we hear commonly around Metrolinx, but without much real sense of what this means. The effect of a transit investment may not be easy to measure especially if other factors at play complicate any cause-and-effect analysis. It is a trivial exercise to find new transit routes that had immediate economic effects and others that took decades to bear fruit. Often, acknowledgement that different circumstances lead to different results is difficult to obtain because projects are sold on the promise of what will follow. “My new subway” will always show the benefit of the Yonge line downtown while “yours” will be doomed to mimic the sluggish development on Sheppard or at the outer ends of the Bloor-Danforth line. In other words, the “evidence” to be considered must include the wider context in which an investment is made, not simply the desire to make a Minister’s line on a map look like the best government project of the century. Politicized analytical tools have no place in good planning. This entry was posted in A Grand Plan, Beyond 416, Downtown Relief Line, Electrification, Finance, Finch West LRT, GO Transit, Scarborough RT/LRT/Subway, Sheppard East LRT, Transit. Bookmark the permalink. Just found another article regarding the construction start date of the Finch LRT – again 2017. When did the start date get pushed 2 years further away into the future? I thought Metrolinx stated in Oct 2013 that they would start these projects sooner now that the LRT in Scarborough was cancelled. Steve: Any dates cited by Metrolinx recently seem to be picked out of a hat. When Glen Murray was still Minister, I heard that the LRT projects would be speeded up, although with Sheppard likely coming first. However, all of the machinations about winning votes in Scarborough are getting in the way. I suspect Metrolinx is just trying to get some of the EA work out of the way.